Here is a simple 4-card tarot spread for the winter season. Take a piece of paper and a pencil and jot down a few ideas about what you want to work on this winter. What’s the plan? What are you trying to accomplish? Where are you directing your energy? What is growing and developing within you? Who is helping you with your goals? When will you get there? I don’t think I always have the answers but I know I always have questions. Can you answer any of these? Use your intuition before you do your own reading or look at the one I have here. You might be surprised by what you already know about your experience before you even look at any tarot cards. Divided your tarot deck into three parts (Major Arcana, Minor Arcana, and Court cards). Shuffle the Major Arcana and draw the first card. This will represent the theme for the winter months (the card at the bottom of the pile represents the summer months if you are curious to know where you will be in 6 months time based on how you direct your energy through the winter months). The Major Arcana card will address a major lesson and what you should be focusing on even if it seems in opposition to your goal. How can I get what I want if a challenging energy is blocking me? Is this part of the process? Where do I need to be right now? Who or what is helping me? 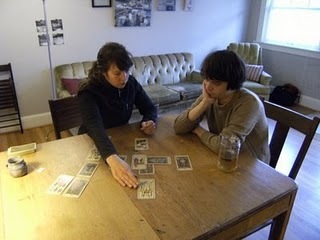 Shuffle the Minor Arcana and draw two cards and shuffle the Court cards and draw 1 card. These cards will tell you more about who or what will be influencing you through the winter months. Where are you in the spread? Is there another person involved in your story? A sample reading or possible path forward. Does it resonate with you? Then it must be for you! The Devil made me do it. I want it now. Impulsive actions do have consequences. Winter trial. Stop struggling. There is just one more thing I need to do before I can actually focus. I feel. Some questions to ask yourself this winter: What is within your control? What happens when you compromise your values? What is the emotional undercurrent of the situation? How might anger or frustration be misdirected (at yourself or others)? What happens when you compromise with other people in your environment? What type of work meets your need for independence, autonomy and freedom and what type of work meets your needs for security, conformity, or safety? The Devil will ask you: What does control mean to you? Sometimes there are circumstances that are beyond your control. Sometimes control makes people feel safe. Sometimes we have to work within conventional structures where control of the environment will ensure that everyone feels safe. How are you responsible to yourself and others? The Devil and 9 of Swords ask questions about the emotional undercurrent coupled with reaction. Who do you resent? Who are you angry at or who is angry with you? Why are you frustrated? What are you worried about? What do you have control over? Here are some open-ended sentences. Take a piece of paper and pencil and jot down whatever comes to mind. You might find you have some answers in the end. I resent people who try to control. I get angry when my plans must be put on hold for other people or because of life circumstances. I’m scared of not having freedom and autonomy. I’m frustrated by people who bully or are dishonest. I want you to help me, but I can’t ask for the help. I feel safe when I have control of my life circumstances and I have my security and safety needs met. I don’t feel safe relying on your passion projects to generate income. I don’t like it when you don’t worry about money. I like it when you share. I feel powerful when I’m able to provide for everyone. I empower myself by working. I am a visionary and I use my vision in the world to create my own success and it provides for myself and my family. I exist within this conventional formula where I have to work more than one job, go to school, pay rent, buy groceries, take care of myself and the people around me. I do not feel victimized by life circumstances. I see the humor in not being able to get exactly what I want when I want it because if I did life would be boring. I am not tied to anyone or anything. I get to choose the people who exist within my world. The people around me value my autonomy, hard-working sensibility and flexibility and know I am a powerful person. I am connected to people in my environment. I am responsible for myself and other people because I am an adult. I have control of my day-to-day attitude and I bring humor and fun to my environment. I exist within a conventional experience because it provides me with opportunity, structure and connections. I maintain healthy boundaries with myself and those around me. Looking towards the summer months I see the Hierophant. Let’s see what you learn about yourself over the winter months and how your self concept might change as you work on healthy boundaries and gain the type of freedom you require. I have some ideas but you have the answers. What I am writing is just a framework for you to discover more about yourself. Continue the story for yourself. Please comment or share if you find that this blog post is useful! *I used the Morgan Greer Tarot deck.